Kuala Lumpur: Whilst governments in the region have committed to climate change and sustainable development goals, more must be done by the ASEAN banking sector if those commitments are to be reached. According to a WWF report released today, robust sustainable banking guidelines coupled with urgent action by banks are needed to prevent a looming environmental and social crisis that could cripple the region’s future economic growth. The report, “Sustainable Banking in ASEAN: Addressing ASEAN’s FLAWS” by WWF and the NUS1 Business School’s Centre for Governance, Institutions and Organisations (CGIO) finds that national commitments to climate change and sustainable development are not well reflected in the practices of ASEAN banks, nor in the region’s banking regulations. Even as ASEAN governments gear up to mitigate the impact of worsening environmental issues on their populations, banks continue to narrowly define and manage environmental risks. This contributes to environmental degradation such as climate change, which will exacerbate business risks for these banks and their clients over the longer term. Through the report, WWF calls for banks to expand their approach to Environmental, Social and Governance (ESG) integration. This requires moving beyond managing short-term risks towards embedding sustainability into their strategy and aligning their portfolios fully with the Paris Agreement and SDGs. While 21 of the 34 ASEAN banks analysed acknowledge that the activities they finance can have adverse environmental and social impacts, none of the banks disclose how they manage climate or sustainability risks at the portfolio level. Further, even though 26 banks refer to sustainability in their strategy or vision, only 12 banks acknowledge the importance of climate risk for society and businesses, of which only one has senior level oversight of climate risks. Shareholders increasingly expect banks to disclose how they manage climate risks in their portfolio as these impact the financial viability of the banks. For Malaysia, at present, there are no specific regulations on sustainable or green finance. Of the six major banks analysed, it was found that their corporate governance practices are relatively better compared to the addressing of environmental and social practices. This may largely be due to the introduction of a series of Malaysian Code on Corporate Governance (MCCG) 2007, 2012 and 2017 which emphasises internalising good corporate governance culture among listed firms. The MCCG requires companies to disclose corporate governance practices applied by the companies or alternatives adopted, to reduce the problem of companies being mechanical about their corporate governance practices. The corporate governance guidelines, listing rules and sustainability reporting guidelines, when considered together, have common elements regarding ESG disclosure requirements. However, to effectively transform the banks’ practices, industry-wide compliance to sustainable finance regulations and guidelines has to be introduced. Malaysia is one of three countries in the report that does not have existing regulations or industry guidelines pertaining to sustainable finance, while other countries have taken different approaches, from mandatory directives to voluntary guidelines. Given these results, WWF stands ready to work with all of the banks in ASEAN to build capacity on ESG integration and improve understanding of key ESG issues such as climate, water and deforestation. Countries need prescriptive sustainable banking guidelines WWF also calls for ASEAN’s regulators to implement prescriptive and time-bound sustainable finance guidelines in order to ensure the wider banking sector is making consistent progress towards these goals. Regulatory frameworks in the form of corporate governance and reporting guidelines are already present in all six countries to support ESG integration. However, not all countries have sustainable banking regulations in place. Regulators can build upon this foundation to incentivise banks to create an ESG integration framework based on robust standards and science based targets. A 2016 study by the Asian Development Bank projects climate change could lead to annual economic losses equivalent to 6.7 per cent of ASEAN’s gross domestic product by 2100; well over the projected global average of 2.6 per cent. Increasing fossil fuel-based energy production, deforestation-intensive agricultural commodities production, and unsustainable hydropower dams will exacerbate these losses. ASEAN banking sector must use the power of its balance sheet to protect ASEAN’s future. 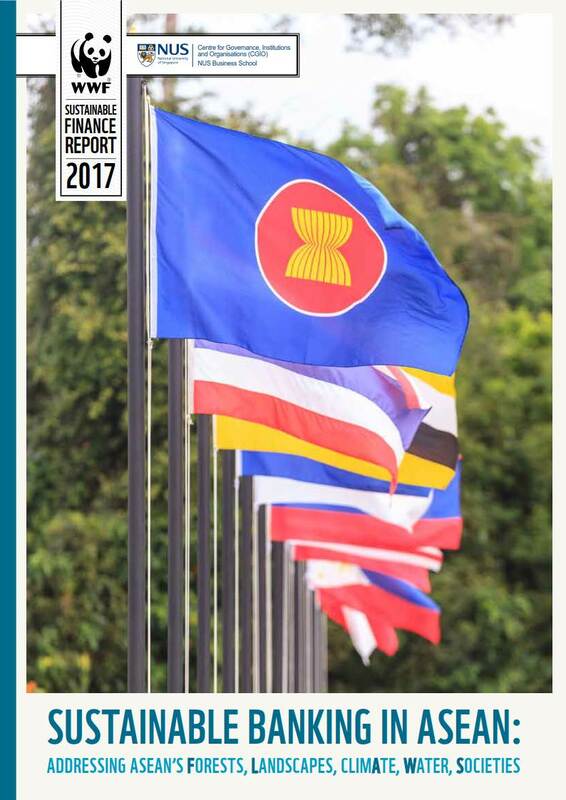 WWF’s ‘Sustainable Banking in ASEAN: Addressing ASEAN’s FLAWS’ report reviews the sustainable finance regulatory landscape in the ASEAN region to shed light on the ESG integration progress of banks and their alignment to sustainable development. It assesses the disclosure of banks from six ASEAN countries against a set of indicators that represent the fundamental pillars of sound corporate governance practices and robust ESG integration pillars. Only publicly available disclosure in the English language in the form of 2016 annual reports, sustainability or CSR reports released before 30 June and information posted on corporate websites were taken into consideration for this assessment.